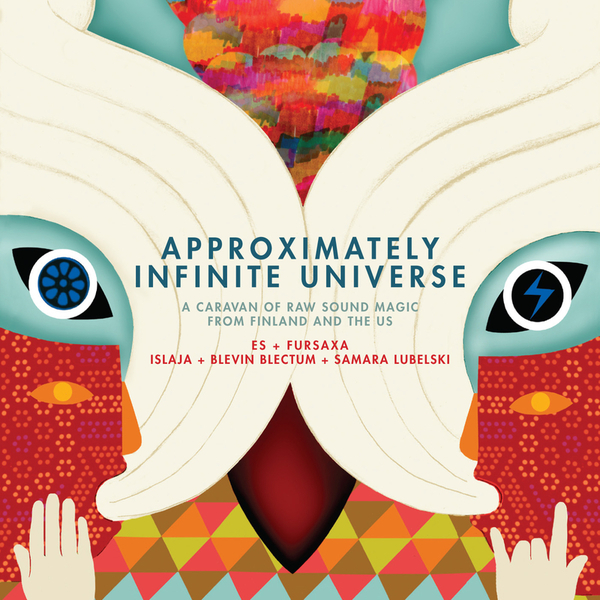 This amazing compilation features a selection of recordings taken from the "Approximately Infinite Universe" tour put together by Diogenes and the No-Fi label back in 2008, featuring exclusive material from ES, Fursaxa and Islaja (in a very special lineup that includes the wonderful Samara Lubelski and Blevin Blectum). The set opens with a heart-stopping 21 minute session from Es & Fursaxa, channelling vapours of chamber music through the carnival of layered organs that have become the trademark of Sami Sanpakkila's Es project, underpinned by a kind of effortless line in sound manipulation that highlights the alien qualities of the material without ever allowing you to forget that you're listening to a thing of considerable magnificence and beauty. The remaining four tracks are supplied by Islaja featuring Samara Lubelski and Blevin Blectum, the first of which, "A Prayer" quietly tiptoes into life with a delicate swathe of quietly dramatic synths and strings, the eventual vocal sounding almost like a religious incantation with all the otherworldly mysticism of the Norwegian landscape thrown into the mix. It's a wonderful, mesmerising experience. "Juniper" is a much more poppy affair, with a plastic beatbox filtered through a hazy arrangement of scuzzy guitars and psychedelic vocals that any followers of Islaja's recorded output will know and love. "The Wanderer's Song" ends the set with Samara Lubelski's instantly recognisable guitar shimmering alongside Merja Kokkonen haunting vocal. There's an almost Proggy quality to the recording, but the quiet interjections of Bevin Blectum's electronic manipulations imbue proceedings with an intangible quality, mixing elements that on paper just shouldn't work but which somehow deliver a magical blend of sounds designed to soothe and disturb in equal measure. A truly magnificent collection and one worthy of your immediate attention. Highly Recommended.